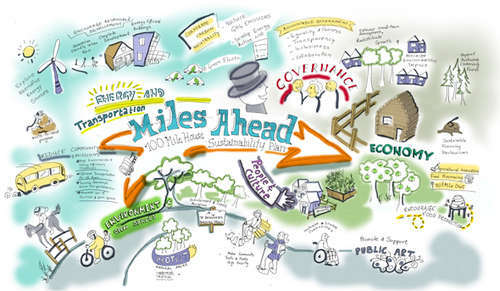 100 MILE HOUSE - After several months of community input the Miles Ahead Sustainability Plan is complete. The plan is the result of a local sustainability planning process that asked residents what they value about the community and their vision for how they would like to see the community evolve. The plan was distributed to Council and the community in early 2015. The Draft plan reflects comments from residents. Highlights of the plan include a community vision statement along with details of the extensive community engagement process. Continue to make 100 Mile House a great community in which to live work and play. Diversify the local economy while building on the community’s traditional strengths in tourism, agriculture and forest products. Continue to pursue financially and environmentally responsible infrastructure, energy efficiency, and reduction of greenhouse gas emissions. Foster community development, health and well-being, through a range of community events and activities. Create and maintain a variety of trails for recreation opportunities and for transportation, within town and connected to outlying areas; as well as pursuing other means of transportation. The District of 100 Mile House and Smart Planning for Communities (SPC) would like to thank all residents for providing input into the planning process. The process will be facilitated in partnership with the District by Smart Planning for Communities (SPC), a partnership program of the Fraser Basin Council. More details can be found on www.100milehouse.com.